Portland cement concrete is produced at a central plant and transported to the job site in transit mixers or batched into truck mixers directly and then mixed at the project site. In either case, the PCC is then dumped, spread, leveled, and consolidated, generally using concrete slip-form paving equipment. Basic components of PCC include coarse aggregate (crushed stone or gravel), fine aggregate (usually natural sand), Portland cement, and water. The aggregate functions as a filler material, which is bound together by hardened Portland cement paste formed by chemical reactions (hydration) between the Portland cement and water. In addition to these basic components, supplementary cementitious materials and chemical admixtures are often used to enhance or modify properties of the fresh or hardened concrete. The coarse and fine aggregates used in PCC comprise about 80 to 85 percent of the mix by mass (60 to 75 percent of the mix by volume). Proper aggregate grading, strength, durability, toughness, shape, and chemical properties are needed for concrete mixture strength and performance. Portland cements are hydraulic cements that set and harden by reacting with water, through hydration, to form a stonelike mass. Portland cement typically makes up about 15 percent of the PCC mixture by weight. Portland cement is manufactured by crushing, milling, and blending selected raw materials containing appropriate proportions of lime, iron, silica, and alumina. Most Portland cement particles are less than 0.045 mm (No. 325 sieve) in diameter. Portland cement combined with water forms the cement paste component of the concrete mixture. The paste normally constitutes about 25 to 40 percent of the total volume of the concrete. Air is also a component of the cement paste, occupying from 1 to 3 percent of the total concrete volume, up to 8 percent (5 to 8 percent typical) in air entrained concrete. In terms of absolute volume, the cementing materials make up between about 7 and 15 percent of the mix, and water makes up 14 to 21 percent. Supplementary cementitious materials are sometimes used to modify or enhance cement or concrete properties. They typically include pozzolanic or self-cementing materials. Pozzolanic materials are materials comprised of amorphous siliceous or siliceous and aluminous material in a finely divided (powdery) form, similar in size to Portland cement particles, that will, in the presence of water, react with an activator, typically calcium hydroxide and alkalis, to form compounds possessing cementitious properties. Descriptions of various kinds of pozzolans and their specifications are provided in ASTM C618. Self-cementing materials are materials that react with water to form hydration products without any activator. Supplementary cementitious materials can affect the workability, heat released during hydration, the rate of strength gain, the pore structure, and the permeability of the hardened cement paste. Coal fly ash that is produced during the combustion of bituminous coals exhibits pozzolanic properties. Silica fume is also a pozzolanic material consisting almost entirely (85 percent or more) of very fine particles (100 times smaller than Portland cement) that are highly reactive. Coal fly ash produced during the combustion of subbituminous coal exhibits self-cementing properties (no additional activators, such as calcium hydroxide, are needed). Similarly, ground granulated blast furnace slag reacts with water to form hydration products that provide the slag with cementitious properties. Coal fly ash and ground granulated blast furnace slag can be blended with Portland cement prior to concrete production or added separately to a concrete mix (admixture). Silica fume is used exclusively as an admixture. An admixture is a material, other than Portland cement, water and aggregate, that is used in concrete as it is mixed to modify the fresh or hardened concrete properties. Chemical admixtures fall into three basic categories. They include water-reducing agents, air-entraining agents, and setting agents. Chemical admixtures for concrete are described in ASTM C494. Water-reducing agents are chemicals that are used to reduce the quantity of water that needs to be added to the mix, at the same time producing equivalent or improved workability and strength. Air entrainment increases the resistance of concrete to disintegration when exposed to freezing and thawing, increases resistance to scaling (surface disintegration) that results from deicing chemicals, increases resistance to sulfate attack, and reduces permeability. Air entrainment can be accomplished by adding an air-entraining admixture during mixing. There are numerous commercial air entraining admixtures manufactured. Descriptions and specifications are described in ASTM C260. Setting agents can be used to either retard or accelerate the rate of setting of the concrete. Retarders are sometimes used to offset the accelerating effect of hot weather or to delay the set when placing of the concrete may be difficult. Accelerators are used when it is desirable to gain strength as soon as possible to support design loads. Calcium chloride is an active material that is most commonly used as an accelerator. Setting agents (retarders and accelerators) are described in greater detail in ASTM C494. Gradation - the size distribution of the aggregate particles affects the relative proportions, cementing materials and water requirements, workability, pumpability, economy, porosity, shrinkage, and durability. The size distribution of the aggregate particles should be a combination of sizes that results in a minimum of void spaces. Absorption - the absorption and surface moisture condition of aggregates must be determined so that the net water content of the concrete can be controlled. Particle Shape and Surface Texture - the particle shape and surface texture of both coarse and fine aggregates have a significant influence on the properties of the plastic concrete. Rough textured, angular, or elongated particles require more water to produce workable concrete than smooth, rounded, compact aggregates, and as a result, these aggregates require more cementing materials to maintain the same water-cement ratio. Angular or poorly graded aggregates may result in the production of concrete that is more difficult to pump and also may be more difficult to finish. The hardened concrete strength will generally increase with increasing coarse aggregate angularity, and flat or elongated coarse aggregate particles should be avoided Rounded fine aggregate particles are more desirable because of their positive effect on plastic concrete workability. Abrasion Resistance - the abrasion resistance of an aggregate is often used as a general index of its quality. Durability - resistance to freezing and thawing is necessary for concrete aggregates, and is related to the aggregate porosity, absorption, permeability, and pore structure. 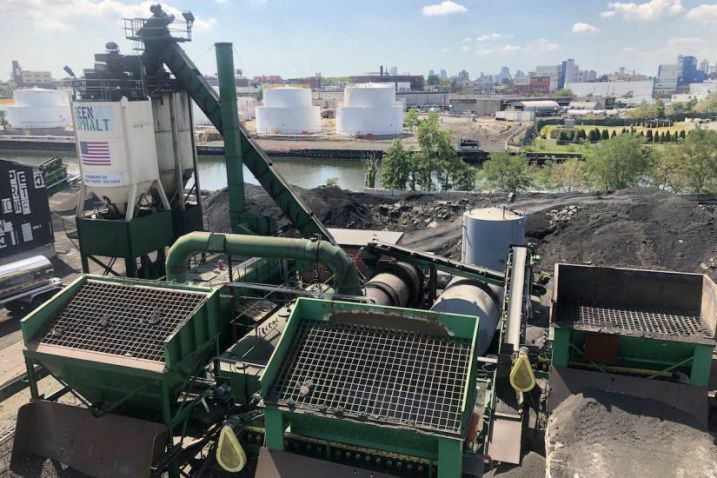 Deleterious Materials - aggregates should be free of potentially deleterious materials such as clay lumps, shales, or other friable particles, and other materials that could affect its chemical stability, weathering resistance, or volumetric stability. Particle Strength - for normal concrete pavements, aggregate strength is rarely tested. It is usually much greater than and therefore not as critical a parameter as the paste strength or the paste-aggregate bond. Particle strength is an important factor in high-strength concrete mixtures. Table 5 provides a list of standard test methods that are used to assess the suitability of conventional mineral aggregates in Portland cement concrete paving applications. Table 5. 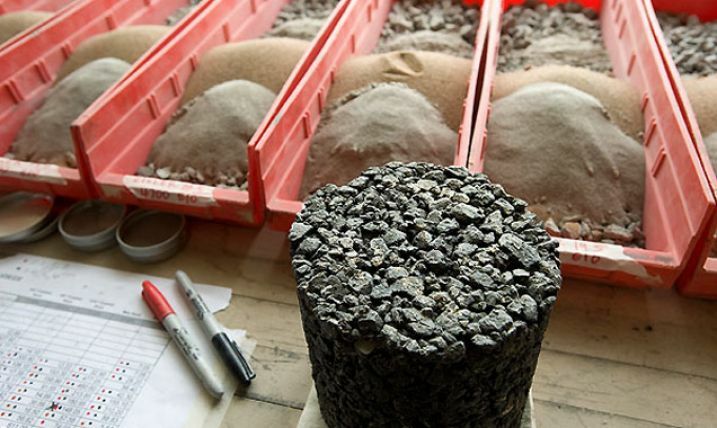 Concrete aggregate test procedures. Chemical Composition - differences in chemical composition, particularly with supplementary cementitious materials that could be less uniform than Portland cement, could affect early and ultimate strengths, heat released, setting time, and resistance to deleterious materials. Fineness - the fineness of the cement or supplementary cementitious materials affects heat release and rate of hydration. Finer materials react faster, with a corresponding increase in early strength development, primarily during the first 7 days. Fineness also influences workability, since the finer the material, the greater the surface area and frictional resistance of the plastic concrete. Soundness - refers to the ability of the cement paste to retain its volume after setting, and is related to the presence of excessive amounts of free lime or magnesia in the cement or supplementary cementitious material. Setting Time - the setting time for the cement paste is an indication of the rate at which hydration reactions are occurring and strength is developing and can be used as an indicator as to whether or not the paste is undergoing normal hydration reactions. False Set - false set or early stiffening of the cement paste is indicated by a significant loss of plasticity without the evolution of heat shortly after the concrete is mixed. Compressive Strength - compressive strength is influenced by cement composition and fineness. Compressive strengths for different cements or cement blends are established by compressive strength testing of mortar cubes prepared using a standard graded sand. Specific Gravity - specific gravity is not an indication of the quality of the cement, but is required for concrete mix design calculations. The specific gravity of Portland cement is approximately 3.15. Table 6 provides a list of standard laboratory tests that are presently used to evaluate the mix design or expected performance of Portland cement and supplementary cementitious materials for use in concrete paving mixtures. Table 6. Portland cement and supplementary cementitious materials test procedures. Slump - slump is an indication of the relative consistency of the plastic concrete. Concrete of plastic consistency does not crumble but flows sluggishly without segregation. Workability - workability is a measure of the ease of placing, consolidating, and finishing freshly mixed concrete. Concrete should be workable but not segregate or bleed excessively. Setting Time - knowledge of the rate of reaction between cementing materials and water (hydration) is important to determine setting time and hardening. The setting times of concrete mixtures do not correlate directly with the setting times of the cement paste because of water loss and temperature differences. Air Content - the amount of entrapped or entrained air in the plastic concrete can influence the workability of the concrete mixture and reduce its propensity for bleeding. Strength - concrete pavements must have adequate flexural strength to support the design traffic loads (repetitions of loaded axles) that will be applied over the service life of the facility. While compressive strength can also be measured, flexural strength is more relevant to the design and performance of concrete pavements. Density - the density of concrete paving mixes varies depending on the amount and relative density of the aggregate, the amount of air that is entrained or entrapped, and the water and cementing materials content of the concrete. Durability - the hardened concrete pavement must be able to resist damage from freezing and thawing, wetting and drying, and chemical attack (e.g., from chlorides or sulfates in deicing salts). Air Content - the finished and cured concrete should have adequate entrained air in the hardened cement paste to be able to withstand cycles of freezing and thawing. Frictional Resistance - for user safety, the surface of an exposed concrete pavement must provide adequate frictional resistance and resist polishing under traffic. Frictional resistance is a function of the aggregates used and the compressive strength of the concrete. Volume Stability - concrete paving mixtures must be volumetrically stable and must not expand due to alkali aggregate reactivity. Concrete paving mixtures should not shrink excessively upon drying. Table 7 provides a list of standard laboratory tests that are presently used to evaluate the mix design or expected performance of concrete paving mixtures. Table 7. Concrete paving materials test procedures. ACI Manual of Concrete Practice, Part 1 – Materials and General Properties of Concrete. American Concrete Institute, Detroit, Michigan, 1994. Kosmatka, S. H. and W. C. Panarese. Design and Control of Concrete Mixtures. Portland Cement Association, Skokie, Illinois, 1995. Neville, A. M. Properties of Concrete, Fourth Edition. John Wiley & Sons, New York, New York, 1996.